Glaston can supply HPC rotary screw vacuum pumps that are completely ready for connection. These convenient systems ultimately reduce the work and costs required for planning, installation, certification, documentation and commissioning. Maximum efficiency plays a key role in all rotary blower or vacuum pump applications. It is achieved through using a blower block that is suited to the application and produces the required vacuum or pressure. It is also important for vacuum pump systems in particular to operate over as wide a control range as possible and deliver optimum energy efficiency. By using a frequency converter, vacuum pump power can be variably controlled to match actual demand. Every HPC rotary screw vacuum airend supplied by Glaston is equipped with energy-saving SIGMA PROFILE rotors. Components manufactured to the highest standards and precision aligned roller-bearings ensure long service life with maximum reliability. While single-stage vacuum generation with liquid injection provides optimum cooling, lubrication and sealing of the rotors. 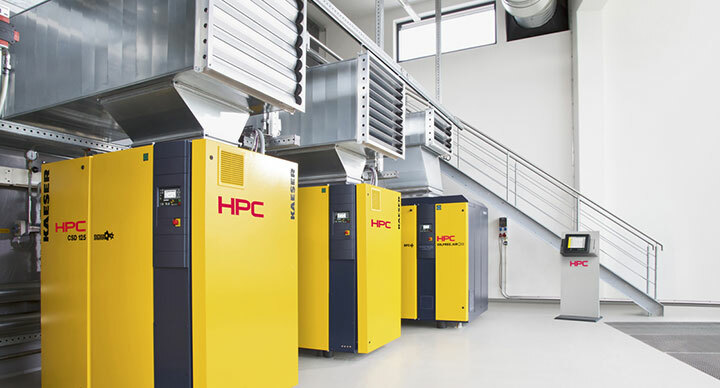 As the most efficient way to achieve a given drive power, HPC uses large, low speed rotary screw vacuum airends. This ensures that the specific power is always within the optimal range. Using a flexible V-belt drive with automatic belt-tensioning, airend speed is precisely matched to suit the specific airend installed in the pump package. Low-speed operation brings additional advantages, such as extended service life of all associated components and enables exceptionally quiet performance. A gas ballast unit enhances water vapour tolerance and prevents vapour from condensing in the pump production chamber, thereby enhancing reliable pump operation. While an effective cooling air flow system guarantees sufficient power reserves even at high ambient temperatures. The air flow system is specially designed to draw cooling air in slowly and helps reduce sound levels to an absolute minimum. At the heart of every HPC vacuum system lies a meticulously engineered airend featuring HPC‘s energy-saving SIGMA PROFILE rotors. They are housed in a strong casing with durable bearings and the entire unit is Made in Germany. The SIGMA CONTROL 2 ensures efficient control and system monitoring. The large display and RFID reader enables effective communication and maximum security. Multiple interfaces offer exceptional flexibility, whilst the SD card slot makes updates quick and easy. IE3 drive motors are characterised by their superior performance and lower losses compared with conventional drive motors. Because they consume significantly less energy, they also enhance overall system efficiency. HPC vacuum pumps feature doors on the top and sides to provide excellent maintenance access; the rear panel can also be removed. These systems can be installed against a wall and long maintenance intervals enhance cost-effective operation.